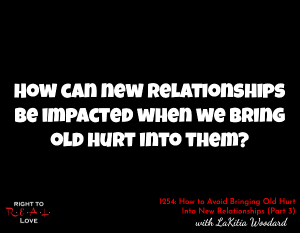 In this episode, Yahnathan continues his discussion with author LaKitia Woodard by addressing the question: How can new relationships be impacted when we bring old hurt into them? How can new relationships be impacted when we bring old hurt into them? How the Holy Spirit can help us heal from old hurts. Why God desires to have a relationship with you. LaKitia shares how God helped her to stop bringing old hurt into new relationships. Monthly Book Giveaway: Enter now for a chance to win a FREE BOOK! Press the colorful buttons below and SHARE THE LOVE!!! What is Right to R.E.A.L. Love?